Every Thursday night millions of viewers tune in to watch popular local music program Rait Musik on EMTV to see their favourite local, South Pacific and classic gold artists perform on TV. Now Rait Musik is bringing your favourite artists from your TV screen in your living room to the stage. Tomorrow night Friday 29th March, Rait Musik is hosting their first ever ‘Rait Musik Live’ concert at the Cosmopolitan, showcasing some of the most popular artists from their program, including some of the hottest artists from PNG and the South Pacific. 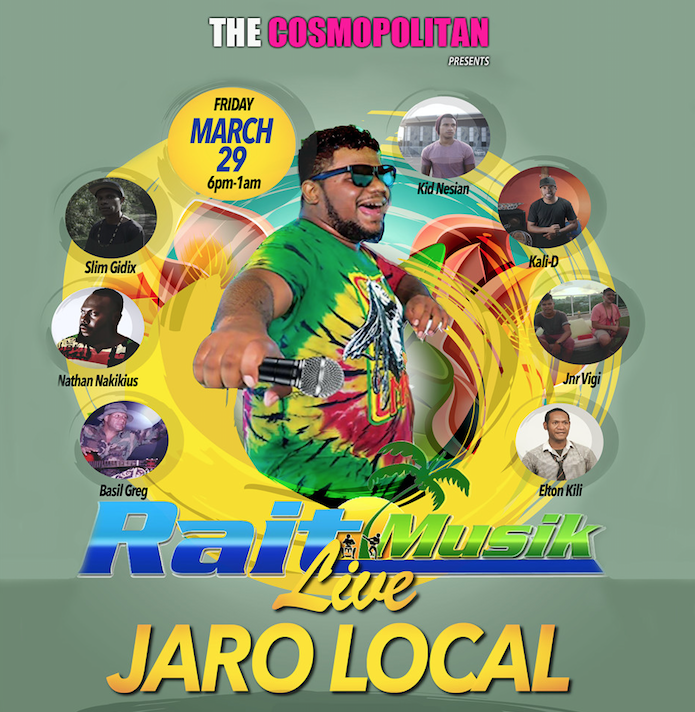 Headlining is one of the hottest artists in the Pacific – Jaro Local from the Solomon Islands, who is fresh off his 8 city Australia, New Zealand and South Pacific tour which sold out every venue. His new song “Vavine” feat local Central duo Jnr Vigi from Keapara is currently hot and climbing the charts. Also performing is the legendary Basil ‘Blitz’ Greg MBE, Slim Gidix, Nathan Nakikus, Kid Nesian, Kali-D and Jnr Vigi. PNG’s no.1 comedian Elton Kili will also be performing a brand new comedy set that is sure to bring the house down in laughter and tears. Tickets are currently on sale for K50 at Vision City at CHM and Music Factory, CHM at Courts and Clearance Haus at Gordons or for K60 gate fee on the night at the Cosmopolitan. Come down and enjoy a great night of entertainment and get your tickets quick before they sell out!